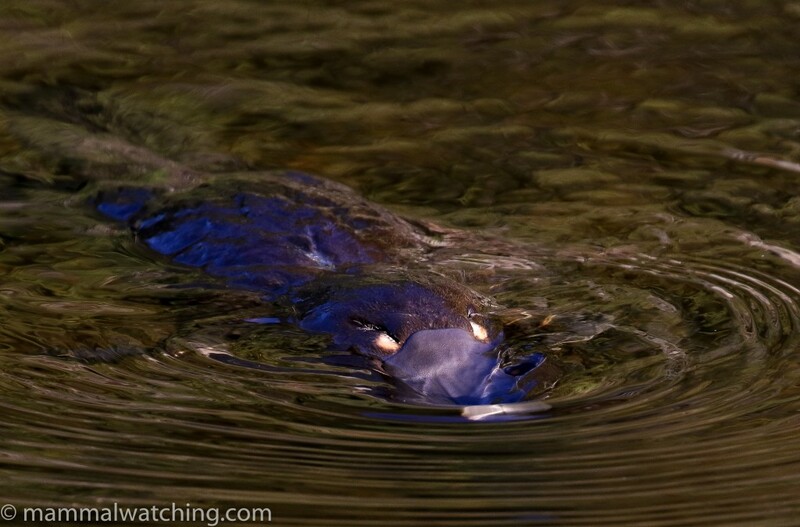 Platypus, Ornithorhynchus anatinus, Mountain Valley Cabins, Loongana. I spent Christmas in Australia. This wasn’t a mammalwatching trip … instead I mainly spent time with friends, sitting in the sunshine and drinking great wine. I believe my two weeks there might be called what is commonly known as a “holiday”. It was a lot of fun, and maybe I will take one again in 20 years or so. 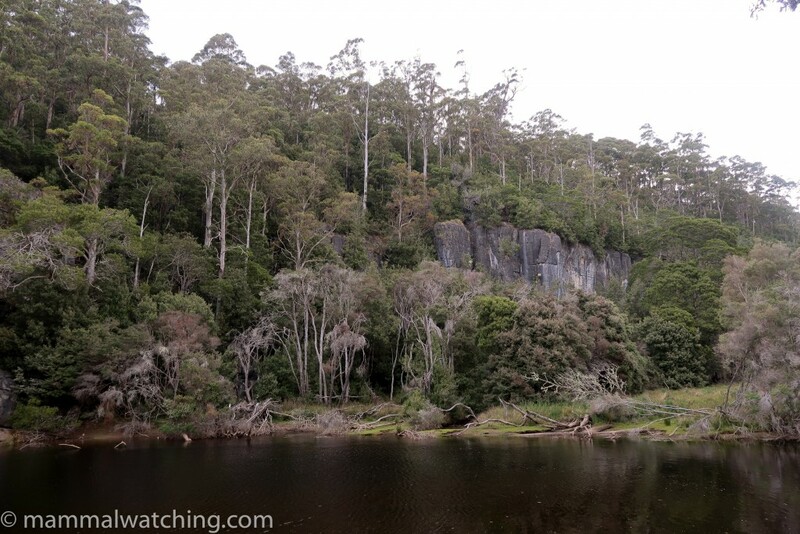 Holiday or not, I did manage to squeeze in a bit of mammal watching in Tasmania. On New Year’s Day I met up with Curtis Hart and Lindsay Gedacht for an evening of spotlighting in Hobart. Curtis, an American, was one of mammalwatching.com’s first contributors yet we’d never met. We were on a mission to find his 700th mammal that evening. Our first stop was on Mount Wellington in Hobart. A short loop track up the mountain (here) was a spot that Angus McNab reckoned we’d have a chance of seeing Long-tailed Mouse (a Tasmanian endemic) and the recently split (and so also endemic) Tasmanian Dusky Antechinus. Other than a couple of Brushtailed Possums and a Tasmanian Pademelon the trail was quiet until the very end, a few metres short of the road, where I got onto a small mammal in a tree with my thermal scope. Curtis relocated it on the forest floor and I took a few pictures. We got reasonable looks – though none prolonged – of the animal and my immediate reaction was that it was the Long-tailed Mouse we were searching for. I was a bit surprised that it was climbing trees but from what Curtis and I could see it ticked most of the LTM boxes. But back home, when I looked properly at the photos I took, it was clearly not a Long-tailed Mouse nor an antechinus. 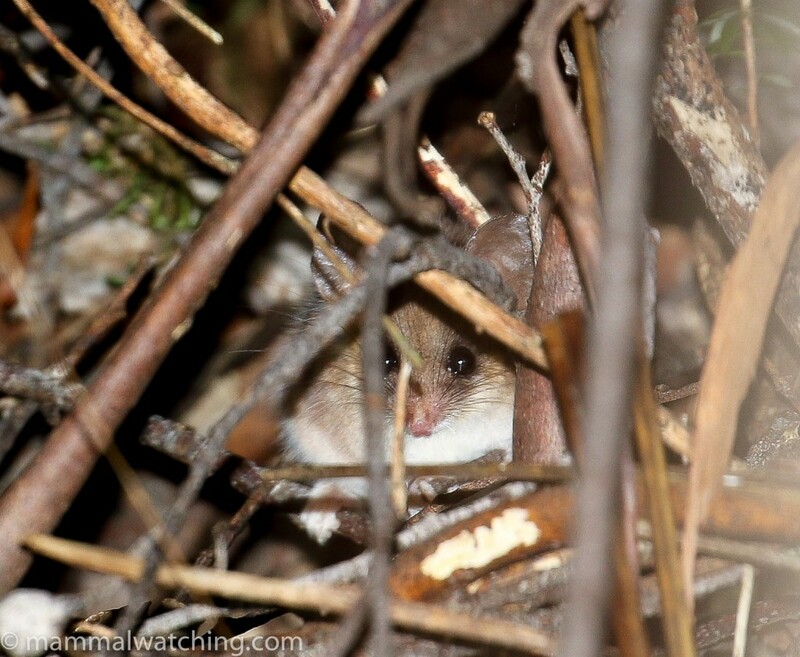 It was either a Little or an Eastern Pygmy Possum. This reinforces the point that several people have recently made on the forum about how difficult it can be to ID smaller mammals in the field, particularly when you have your heart set on seeing a certain species. I am sure there is a well known psychiatric disorder for this phenomenon. I’m sure I suffer from it. If I hadn’t taken any pictures I am pretty sure I’d have recorded this as a definite Long-tailed Mouse. So beware of all of my small mammal IDs that don’t have pictures. The two species can look very similar. After some soul searching (spoiler alert I desperately wanted this to be a Little Pygmy Possum) and discussions with Australian mammal watching gurus I wavered between the two species but there seems consensus that it is a Little Pygmy Possum on the basis of its color and how delicate it looks. Of course if someone can thinks otherwise please let me know! This small reserve, a 15 minute drive from our stop on Mount Wellington, used to be a reliable place for Tasmanian Bettongs, the most difficult macropod to see in Tasmania. We spent an hour or two wandering around the reserve trying to spot a bettong among the hordes of Bennett’s Wallabies and Red-necked Pademelons. We dipped. Possibly because there was a gang of feral cats (about 6 animals travelling in a pack) inside the reserve. Bettongs are, I am told, still present in the reserve but possibly less common than they were a couple of years ago. 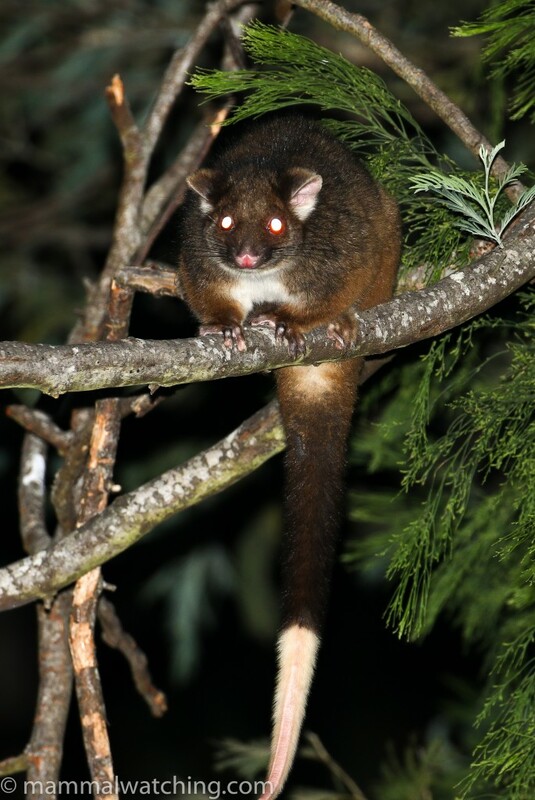 Two Ringtail Possums and a few Brushtail Possums were the only other mammals we saw. Curtis finished the night with a life list of 699. Back in 2010 I spent two fun nights with my kids at Mountain Valley Cabins in the north of the island. The cabins are well known for the Tasmanian Devils and Tiger Quolls that come every night to eat the chicken that is put out for them. I wanted to return, mainly to get a decent look at a Tiger Quoll, a species I missed last time I was there and which I have only seen – poorly – once. Len, the manager, has been feeding Tasmanian Devils here for over 30 years. Back in 2010 the place was alive with devils but things have changed. There are far fewer Tasmanian Devils there now. There are far fewer Tasmanian Devils in general because of the facial tumor disease that has led to a 95% decline in the species since the mid 1990s. Len told me that even fewer devils than normal had been visiting over the past few nights and were arriving very late. He didn’t know why. Tiger Quolls seem to make an appearance about two nights in three from what I could gather. The cabins are close to a creek that’s a reliable spot to see Platypus. I saw them within minutes of arriving both days in the late afternoon. I also saw a Wombat across the creek at 6pm on my first afternoon. I saw devils both nights outside my cabin; after 1 a.m on the first night, and just before midnight on the second. I did not see a quoll, though I should have paid closer attention as the camera trap showed one outside my cabin just after midnight on my first evening. Damn. I don’t know whether any came on the second night though I sat up til 2am spending much less time playing a game on my phone and much more time staring out the window than I had the night before. Quolls aside there are some other good mammals to look for here. Two weeks before my visit Dan Brown saw a Long-tailed Mouse in front of his cabin. He then saw it get eaten by an owl and none had been seen since. It would be worth asking about that species, as well as Tasmanian Dusky Antechinus, which are regularly spotted in front of the smaller cabins closest to the driveway. They live under the deck I think. 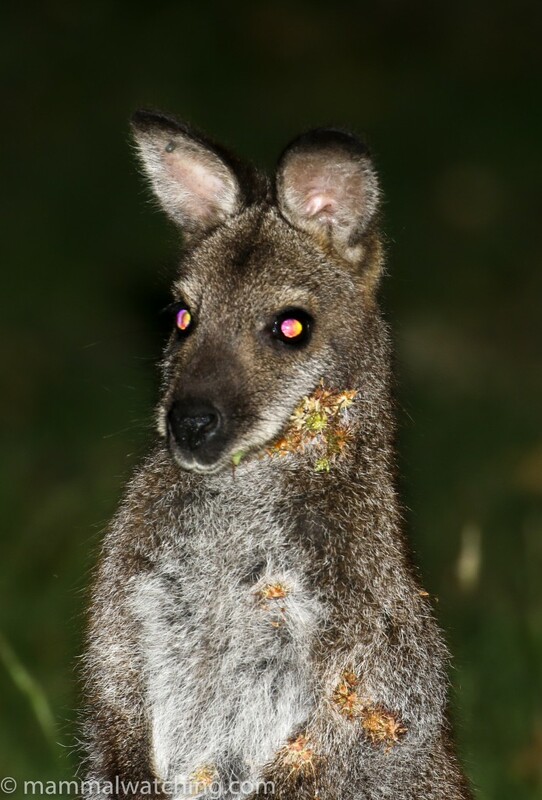 I wandered around on my first night with my thermal scope looking for small mammals but didn’t see anything other than a couple of devils, a few Brushtail Possums and many pademelons. Len politely told me the next day that I probably shouldn’t leave my cabin as it might scare away the devils. Fair enough though a little constraining. I’d suggest visiting here in a season quieter than Christmas, when you might have the place to yourself and can wander around without worrying about interrupting other visitors’ devil watching. 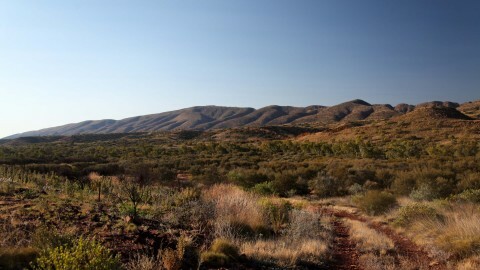 Booking one of the standard cabins will increase your chances of seeing the antechinus or the Long-tailed Mice I suspect.